The Mitsubishi P93DW thermal printer provides high speed, high resolution, monochromatic printing for a wide range of uses. This compact thermal printer prints 3.9 x 3.0” images in roughly 5 seconds, at a resolution of 1280 x 500 pixels, and 325 dpi. The P93DW is simple to operate, with up front user-friendly controls, that allows users to adjust brightness and contrast, lock settings and automatically feed. 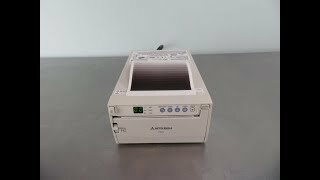 This Mitsubishi P93D Thermal Printer has been fully inspected and is operating without issue. All of our lab equipment comes backed with our standard warranty. Should you have any questions, please don't hesitate to contact us.